Updates: The JTWC forecasts Hagupit to pack 240 kph (130 knots) by December 6 (Saturday), 8 a.m., when it is nearer the Philippines. PAG-ASA tracking possible strong typhoon RUBY (Hagupit) that may hit Philippines. It will enter in PAR this December 5-6, 2014. The new cyclone will be named RUBY once it will enter the Philippine Area or Responsibility (PAR). PAG-ASA said that typhoon RUBY is expected to be strong and may follow the track of supertyphoon Yolanda last year. Typhoon Ruby is expected to be strong because it's too far from the land and could gain more strength as it moves closer to Philippines. There are two possible scenarios about the coming typhoon Ruby. Weather officials said that the movement of new typhoon will depend on the High Pressure Area (HPA) located northeast of the Philippines. If the HPA moves then the new cyclone will not hit Philippines and moves towards Japan but if it will not move it may follow track of Yolanda (Haiyan) and make landfall in our country. State meteorologists are keeping a close eye on a developing storm off the Pacific Ocean that could enter the Philippine area of responsibility (PAR) later this week. Jori Loiz, senior weather forecaster of the Philippine Atmospheric, Geophysical and Astronomical Services Administration (PAGASA), said the looming cyclone was located some 1,500 kilometers east of the PAR as of yesterday afternoon. He warned the developing weather disturbance is likely to reach the typhoon category as it hovers over the Pacific Ocean in the next few days. Loiz told The STAR of two scenarios for the cyclone. The most likely is that the storm could intensify further but will veer north towards Japan. The second scenario is the cyclone will intensity into a typhoon and enter the PAR on Friday. “The movement of the developing cyclone will depend on the high-pressure area northeast of the Philippines,” Loiz said, noting that the HPA has not moved in the past days. “The most possible scenario is it will enter the PAR but will recurve toward east of Japan… But if the HPA will not move, the cyclone, which could be a strong one, could make landfall in the Philippines,” he added. He noted that the location of the looming cyclone is also the place where Super Typhoon Yolanda formed last year. “Hopefully, the HPA will move, because we expect this to be really strong. It is still far and could gain more strength while over the sea,” Loiz said. He said one or two cyclones are likely to enter the Philippines this month, warning that cyclones during this time of the year usually make landfall. The usual track of the cyclones during the latter part of the year is Visayas and Mindanao. On Nov. 8 last year, Yolanda slammed the Visayas, leaving more than 6,000 people dead and 1,700 missing. Strong storms Pablo and Sendong hit Mindanao in December. Meanwhile, Loiz said fair weather is expected in most parts of the country in the next three days, apart from isolated rain showers and thunderstorms. 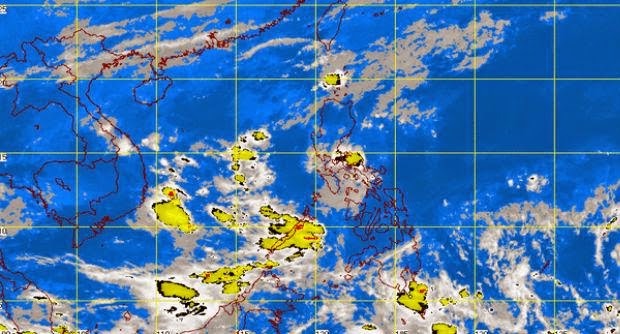 He said a low-pressure area (LPA) that dumped rains in Mindanao and parts of Visayas and Luzon over the weekend was spotted at 75 km west southwest of Romblon, Romblon as of 10 a.m. yesterday.